BinRenew Does the Dirty Work for You! 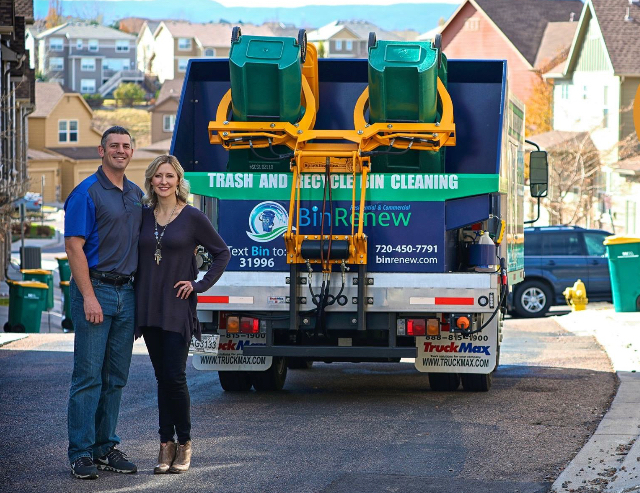 Bin Renew is the only garbage can cleaning service in the area offering a revolutionary cleaning process using clean hot water. Other systems reuse dirty water that was previously used to clean bins. Our system heats the water to over 190 degrees and kills 99.9% of the bacteria currently living in your bins. Providing the most sanitary, effective and environmentally safe trash bin cleaning system is our priority. We are not a franchise. We are a Veteran-owned and family owned business. After becoming a BinRenew customer, your service will be scheduled for one of your designated trash and recycle pickup days. Our technicians "shadow" the routes of the pickup companies. After the bins have been emptied, and while at the curb, our technicians come through to clean, sanitize and deodorize your bins. The service is complete, right there at your curb, with the application of an easily removable seal to let you know we were there. Our garbage can cleaning service takes just a few minutes and your satisfaction is guaranteed! Driveways, sidewalks, patios, fences, houses and more!